Sound patterning is also of great concern in any attempt to analyze Pound’s prosody. 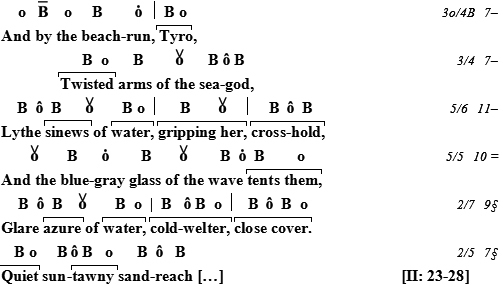 An example given earlier, also demonstrates the poet’s discerning understanding of interplay between variable vowel length and contrastive consonants. ‘Dakrùon’ consists of long vowels and hard consonants, ending in a nasal – with relentless medial word stress. The consonants (both semi-vowels) in ‘Laval’ are soft and the vowels, long. ‘Pétain’, on the other hand, presents a reversal with hard consonants and short vowels – in addition to initial word stress (falling meter). The pauses (juncture) are emphatic. ‘Gli’ is infinitely liquid, and ‘onèsti’ returns triumphantly to the long vowel pattern as well as medial word stress (oBo). ‘Weeping’ for the destruction of European civilization, the auctor implies a comparison of Laval (recently executed as a Vichy collaborator/traitor) and le grand Maréshal Pétain (spared because of past glories and advanced age) to Dante and Virgil in the ‘Circle of the Damned’. The latter are acclaimed by the condemned as ‘honest men’ (L’inferno, VI: 73). The original reads: “Giusti son due”, and the substitution of ‘honest’ for ‘just’ is characteristic of Absolute Rhythm. Compare ‘seven lakes’ as opposed to the actual ‘Eight River Scenes’ [XLIX: 1], or the French, ‘pervanche’, for ‘periwickle’ [LXXVI: 239], or the brilliant substitution of 'garofani' for 'carnation'. The last example is particularly indicative of Pound's strategy; Both words have mediasl stress, but the Italian is infinitely more emphatic than the English. 9 | ‘Far’ and ‘near’ refer to conventions of East Asian, landscape painting as recorded by Ernest Fenollosa “With usura the line grows thick” [XLV: 18] also stems from the same source. In paraphrase: God shines forth in heaven – his creation – more brightly than does the sun we see in the sky. A cliché made new by metrical invention. The run-on set (4B) climaxes in the following 5B line with its asymmetrical strong stress on ‘look’ before returning to regularity, and the interplay between tri-syllabic and di-syllabic units is the name of the game. Pound’s grammatical manipulations and metrical ploys often astound. Take for example a minor, switch-back sequence. The preceding context has to do with 1890’s decadence and Yeats’s withering judgment : “half dead at the top”. The first three lines form more-or-less regular sets, however intricate, but the next startles both by the incongruity of the reference and its grammatical incompleteness – Donatello’s what? There is, however, a natural connection in that art is the alternative to finance capitalism which corrupts. Mr Keith can only be an elegantly built, African-American detainee, and Pound sees him as a Donatello bronze. 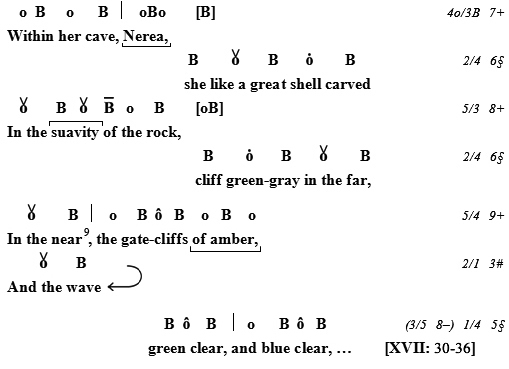 Then follows an invocation for protection to Dionysus’ ‘familiar’ and a metrical reversal to lush lyricism. The assertions and their ‘positioners’ echo one another, but the incompleteness beggars immediate understanding – even as their arrangement into units with demi-refrain and a matching, run-on set, ending in an Unrealized Beat, is bewildering. What does affirming ‘the gold thread’ lead to and what can ‘Vicolo d’oro’ signify? The mosaics of the cathedral at Torcello feature a ‘gold thread’, a visual unifier implying wholeness/continuity – as had the wave pattern in the stone at Excideuil [CVII:82]. Another, and very natural, thread in Pound’s cosmic pattern is the Vicolo d’oro – most probably the hill path (salìta) which led to Olga Rudge’s apartment at St’Ambrogio overlooking the Gulf of Tigullio. ‘Salìta d’oro’ wouldn’t do. The achievement is that of paired phrases interrupted ba a strong medial stress, congruent with a multi-syllabic word with medial stress. Such a construction was first exploited in 1916.The structure, and success, of 'In a Station of the Metro' hinges on the opening, "The àpparìtion", a startling dipod, followed in this case by two contrastive rhythmic sets. The first is slack (dupal, rising meter) – "of those fàces", while the second taut, opening with an intiial stress (falling meter) and heavily stressed – "Pètals on a wèt, blàck bòugh." In traditional terms Pound’s prosody in The Cantos could be described as variable line lengths in rising, dupal meter with contrasting falling units and constant interplay between rhythmic sets and line lengths, while proportion is maintained over the long run. Actually rhythms undulate according to meaning and sought-after emphasis. Tensions between eye and ear recognition, as well as emphatic pauses, are crucial. The clustering of heavy stress and reversals of word boundaries (initial and medial stress) cannot be ignored, nor sound-patterning and grammatical consternation. The end-effect is a vital (living) rhythm which hovers about a norm, but executes sudden flourishes that contrast with longer, more relaxed sets. Expansions and contractions of timing inform our perception of the poet’s intention. They modulate from hammering insistence through prose-like passages to sumptuous lyricism, always adjusted to immediate requirements. Generally speaking, rhythm is generated and regenerated moment by moment. The opening up and closing down of possibilities is central to the reader’s understanding of on-going meaning. Flows and eddies, twists and turns, stops and sweeps are both the medium and the message.